When I opened my birthday card from my dad this year, I looked at him and smiled. Then I giggled as I told him he got me the same card last year. And signed it the same way, simply "Dad" and not anything else. We both thought this was hilarious. And so typical, because my dad tends not to remember things like this. But when I went to add this year's card to my pile of cards that I keep for who knows what reason given the lack of handwritten notes, I realized that this wasn't the second year in a row for this card. It's the THIRD year in a row that my father has given me the exact same card! That is so cute!!! He must mean the words on those cards! That's hysterical. Wonder how many years in a row they will sell that card??? That's so funny! My mother-in-law did that three years in a row too! 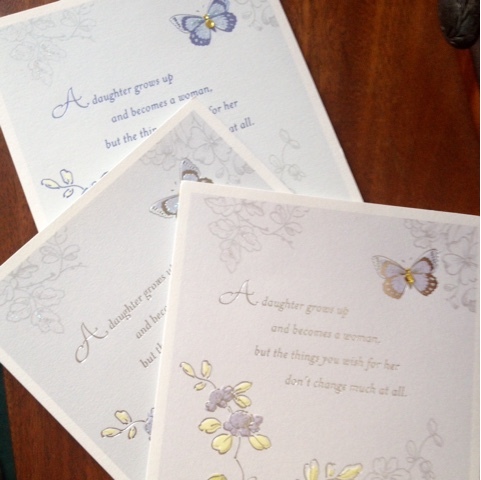 I never told her, but I still have all three and often wondered if she really didn't remember or if she just thought it was the perfect card and kept re-buying it! Oh my goodness!! This is too funny but it looks like a very sweet card so I'm guessing the sentiments must be spot on :)!